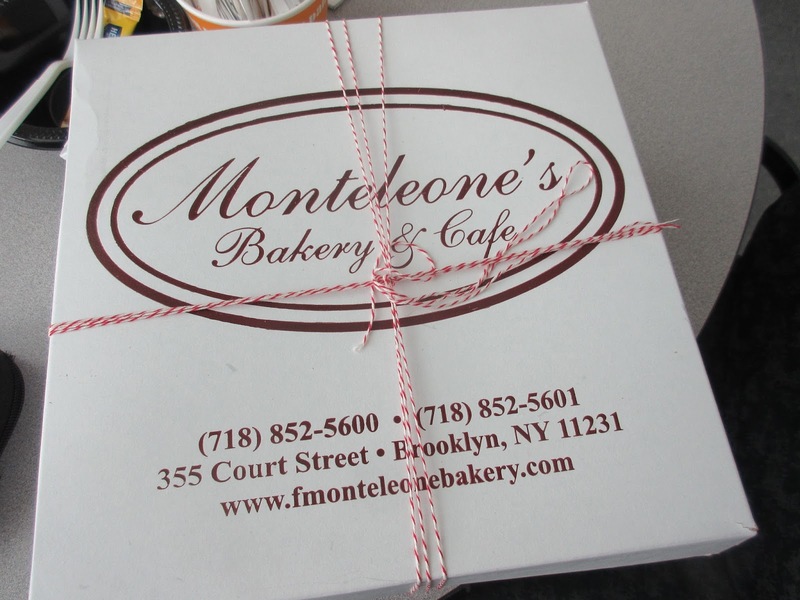 We got one of those texts that we love to get on Monday....sign me up for cake hour tomorrow! 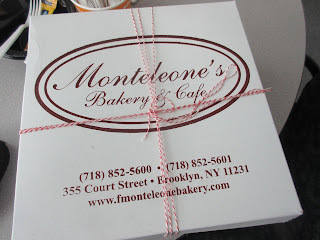 Someone was coming back from Brooklyn, NY and was bringing something. It was supposed to be a cheesecake but at the last minute she opted for something else that looked good. We will have to wait for the classic NY cheesecake for some other time. 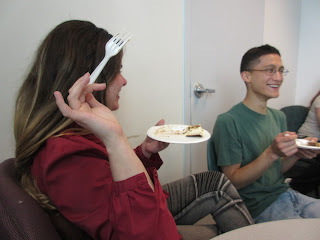 She dropped off the cake and then spent the next hour chatting with a mentor so we never really saw her at cake hour - which is something she has done before. But that certainly didn't stop us. Who needs her when we got the cake? 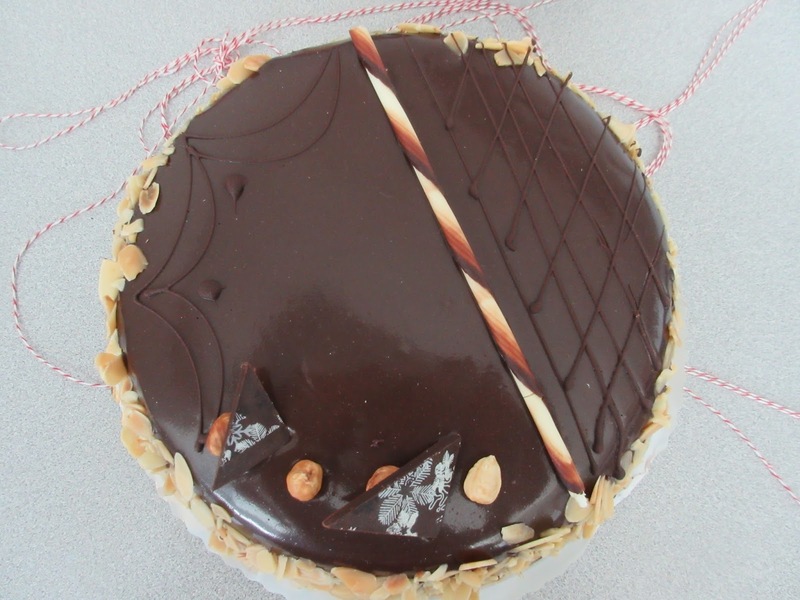 This is not a cheesecake for sure! Avant garde look on the top with a tubular element! I think the hazelnuts are a hint for what is to come. This was a nice looking thing for sure. It was not that tall with a silky chocolate frosting like you see on all those flourless chocolate cakes. 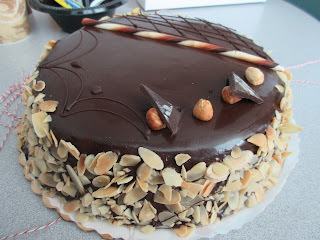 The side of the cake was covered with slivered almonds which made for a nice look and there were random pieces of chocolate and some hazelnuts to embellish the top. 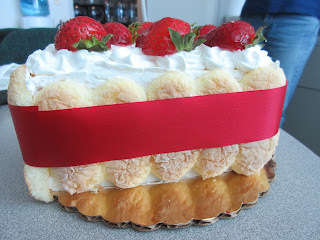 We liked the white chocolate tubular thing as this made the decoration a little avant garde. 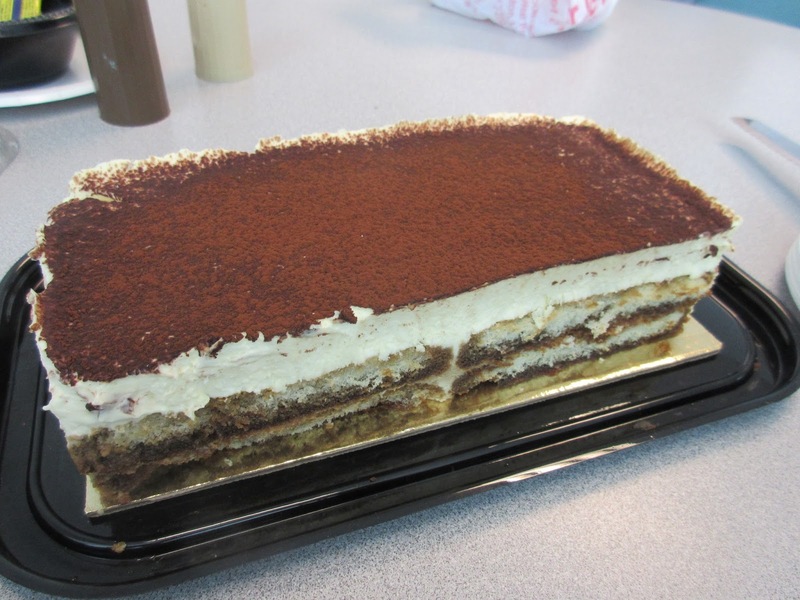 Two small layers with a cream filling were just about right! 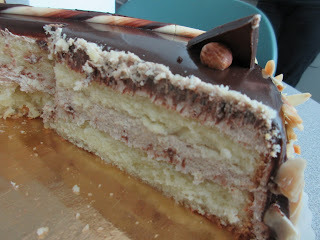 The cake was a white vanilla cake with a hazelnut cream filling. 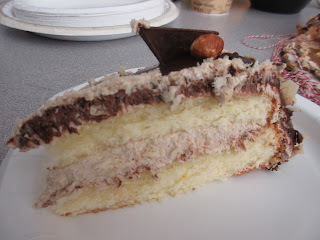 It was lighter than it looked with the hazelnut and chocolate flavors nicely complementing each other. It had a little bit of the Ferraro Rocher taste. It hit the spot with the crowd as you can tell by the number of empty plates. Thanks for our treat from Brooklyn and hope to see you with the cake next time! Thumbs up from this group! An empty plate says it all! Another satisfied and sated customer! 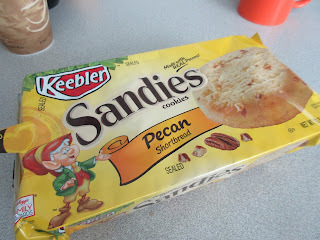 Pecan Sandies are a classic Keebler cookie that usually runs for about $3.50 - $4.50 depending on where you get them. While strolling through a nearby store we noticed they were on sale for 2 for $4.00. Who could pass that up? 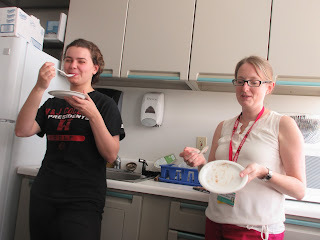 As it turns out we had not cake volunteers for the last two days so the Sandies came in handy. They were on sale at a great price! 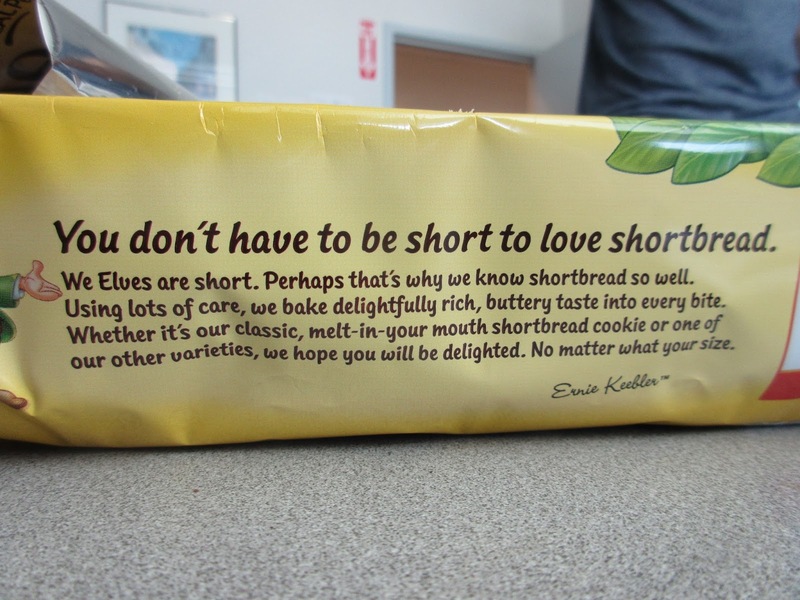 In case you haven't heard of them, they are an American version of shortbread which originated in Scotland. It is a cookie made with flour, sugar and butter. 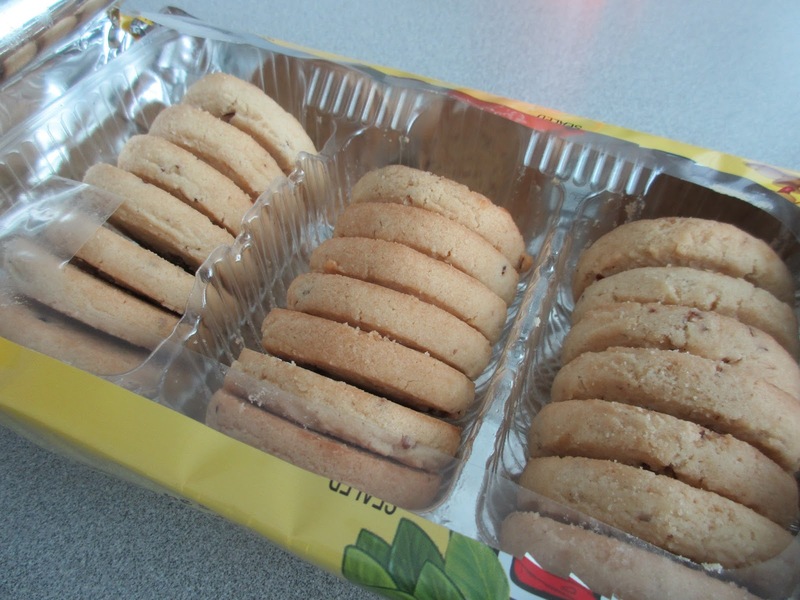 The buttery taste is what shortbread is known for as is the resulting high fat content. A few of these cookies can pack a few calories to say the least. 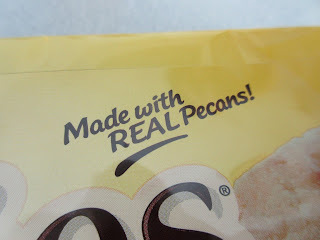 Pecan Sandies get their name from the pecan chips that are added. 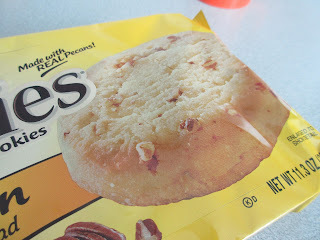 Although these might not be as smooth as something from Walker's, these are actually pretty good cookies and they go great with coffee, tea or even ice cream. The classic Sandie - just like on the cover and about the same size! Keebler cookies are supposedly made by elves. 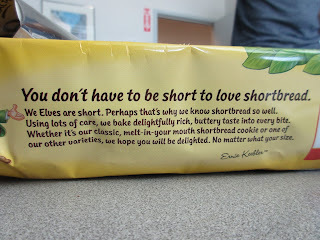 We like the little disclaimer about not being short to enjoy their shortbread! We have new colleagues all the time that come for a postdoctoral fellowship or student internship of various kinds. 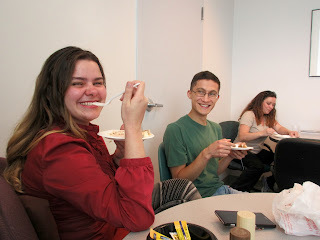 We are always happy to have them join in for cake hour and even happer when they sign up and show up with a cake. 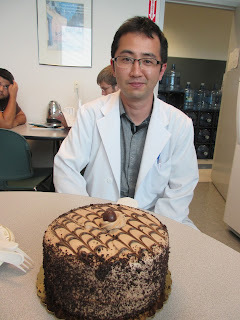 Today we had our most recent postdoc pitch in for his first donation... a Mocha cake from Eastside Marketplace (I think). 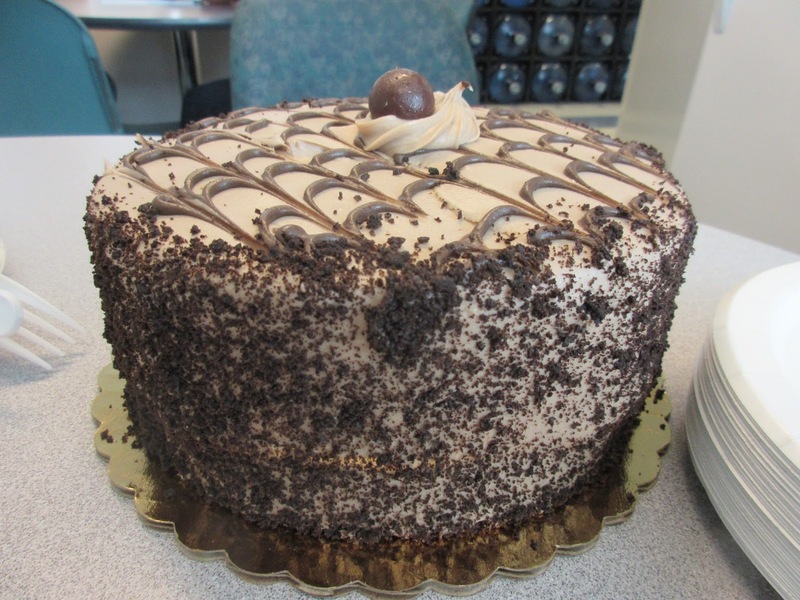 For my first cake.....it's Mocha! Something was crushed and put all over the sides. Nice accents with the chocolate! 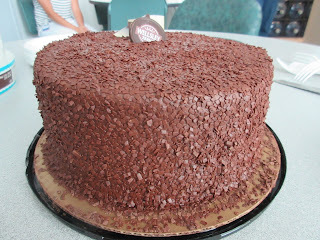 We have actually seen this cake several times before and we like it as a solid representation of an American chocolate cake. 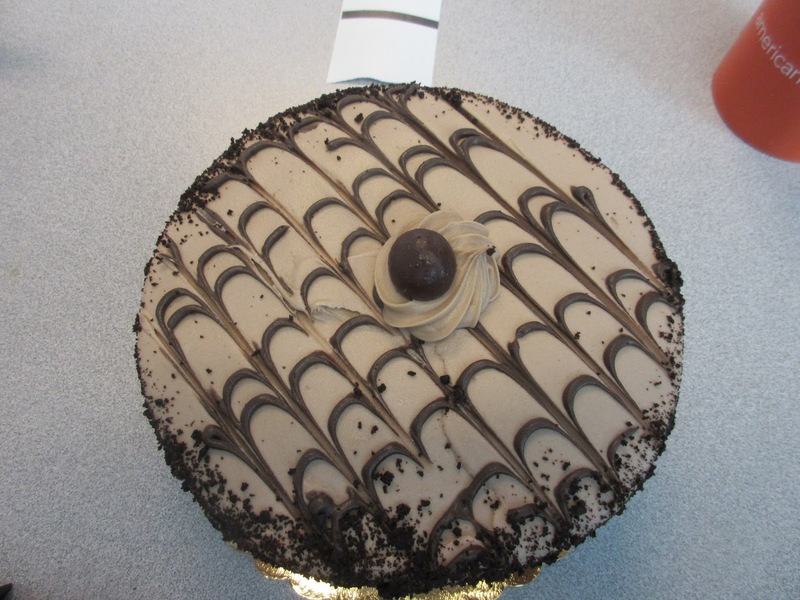 The Mocha part is the frosting and there is indeed a hint of coffee flavor though not overwhelming. This one had the typical double layer and a butter or other cream frosting that is always better when it is at room temperature. 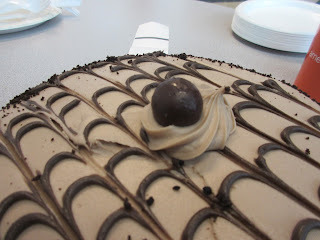 A random malted milk ball for the center. It is nicely decorated with some chocolate swirls and crushed cookies or something similar on the side. The one interesting thing about this cake is the single malted milk ball in the center. Where else do you ever see malted milk balls except at Easter. Interesting! 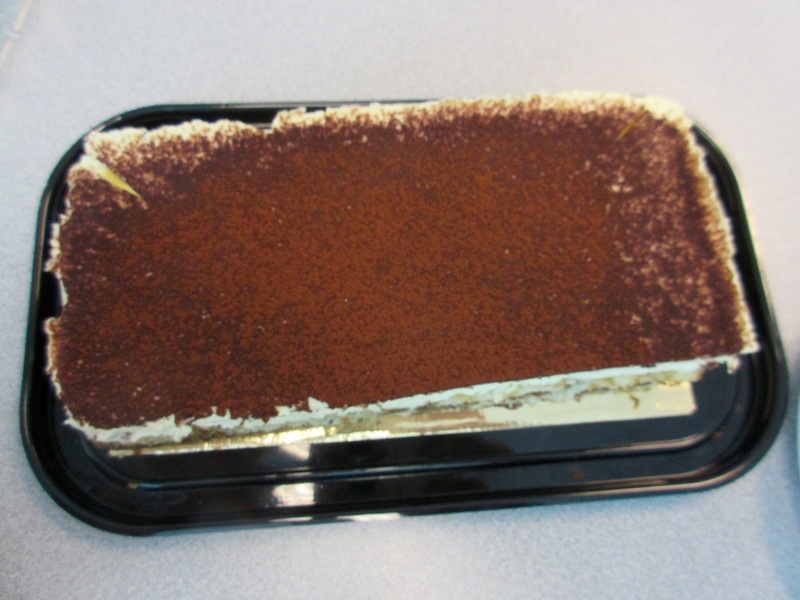 So our colleague has been well initiated into cake bringing and here's to many more! 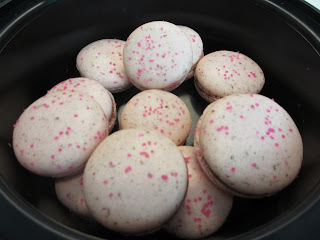 We also had a last minute addition of some strawberry macaroons homemade by one of our favorite cake hour bakers. As usual they were great and a special extra treat! 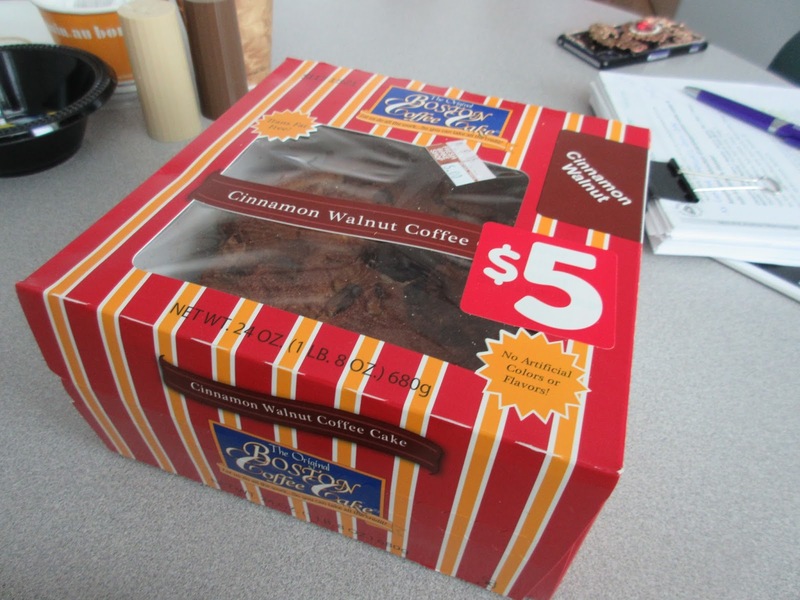 The coffee cake was on sale!! There is whole line of Boston Coffee Cakes. They usually cost about $7.99 to $8.99 in stores. So when you see a big $5.00 sticker on the cake you grab it up! 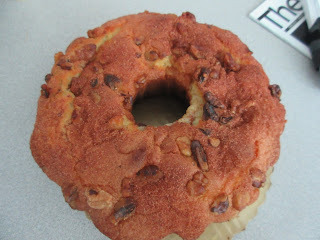 Boston Coffee Cakes makes many different varieties but we went for the classic cinnamon with walnuts cake which is a favorite. Notice there are no artificial colors or flavors! 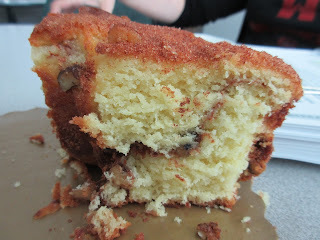 And it looks like a coffee cake! Chinks of walnuts and cinnamon sugar for the top! 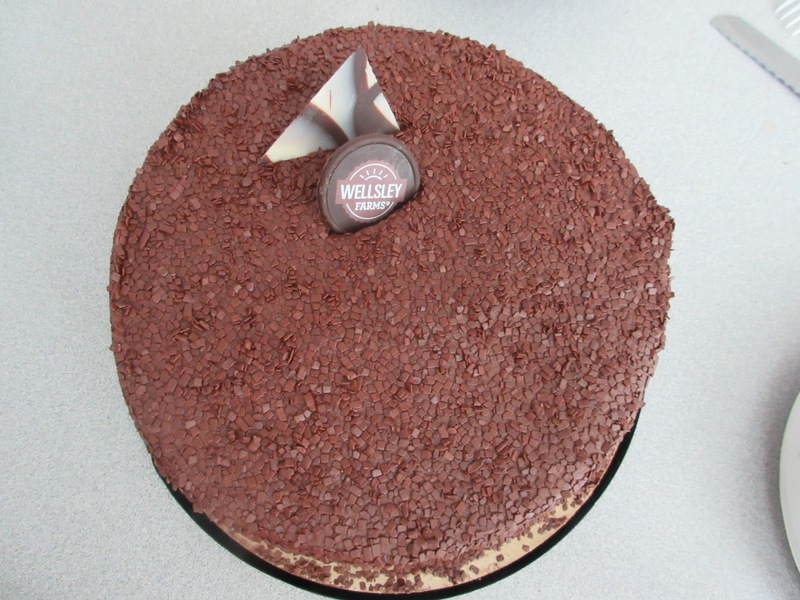 This cake is a standby that we are always happy to see. The cake is nice and moist with a ribbon of cinnamon sugar running through the middle of the yellow cake. 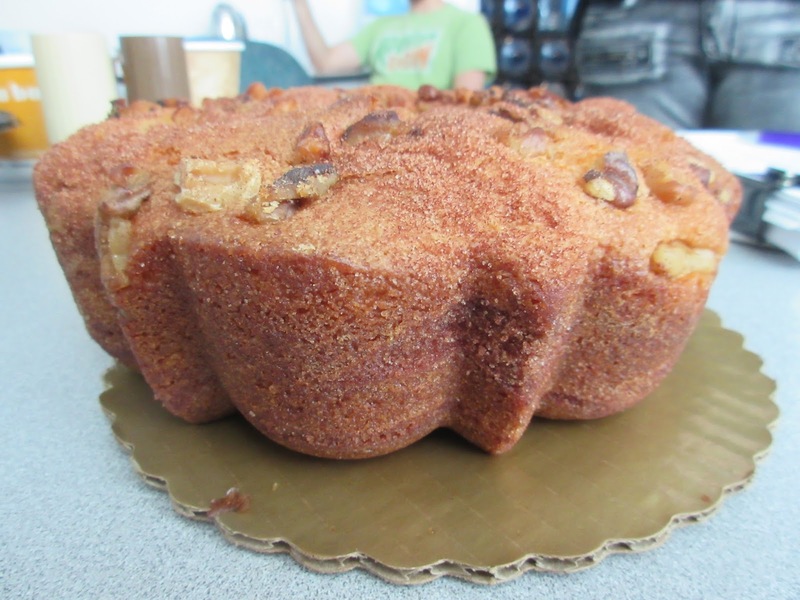 It is never too dry and goes very well with coffee which is probably why it is called a coffee cake. If you ever see one with the $5.00 sticker go for it! A swirl of cinnamon is the finishing touch! 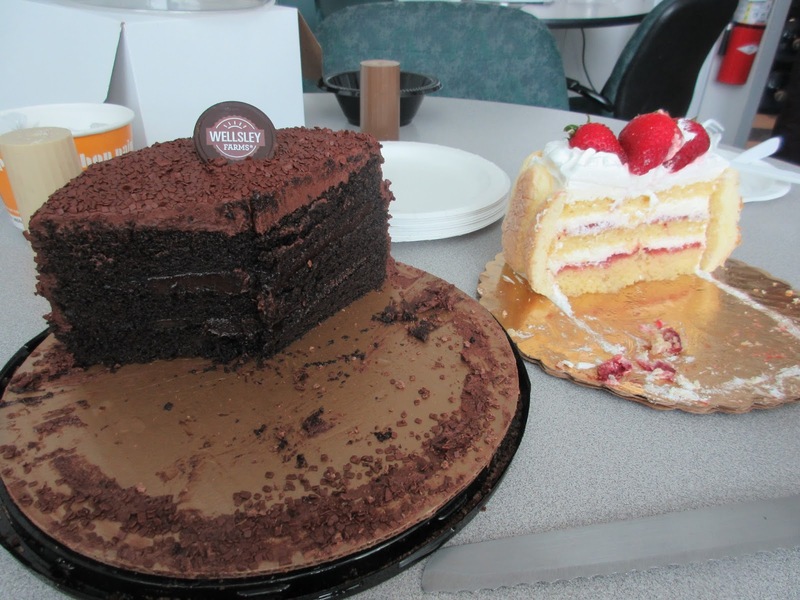 Since a lot of the ravenous summer students were offsite for the last few days, and we've had good size cakes, we ended up cakes left over. Just like home, we never waste food and when their is nothing new coming we go with the leftovers. These things should look familiar from the previous days' postings. These things should look familiar! Notice there is also strawberry filling between the layers! 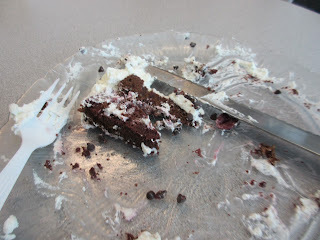 Quarter chocolate cake also had to be finished.! Now that there is no longer ten feet of snow on the ground and it is getting warmer, some of the types of cakes more predominant in summer are starting to appear. 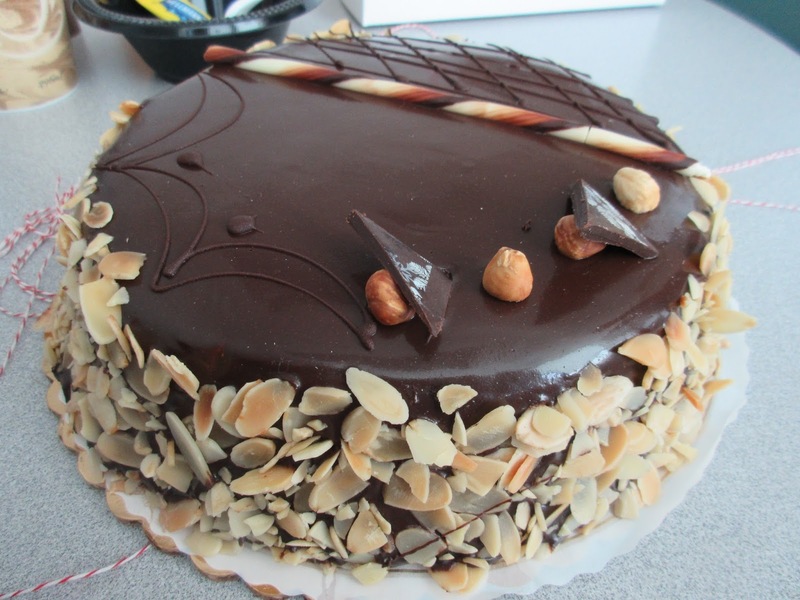 Our cake person for today was not impressed with the selection at the Eastside Marketplace when he went the evening before so he returned in the morning to check for something better and he found something hot out of the bakery prep room or whatever you call it. The summer treats start to appear but it ain't no shortcake! Bound with a ribbon for a decorative twist! They called it a strawberry shortcake but it wasn't the real thing. 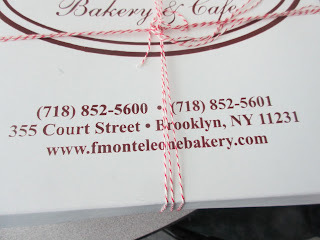 The cake part was yellow cake and rather than having frosting on the sides they closed it up with lady fingers and bound it all together with a ribbon. This made for a nicely decorative presentation btw. 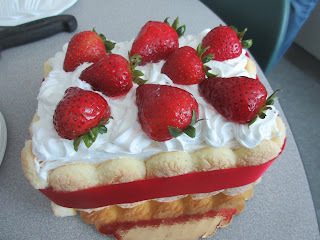 The top had a thick, swirled layer of whipped cream garnished with some very red fresh strawberries. 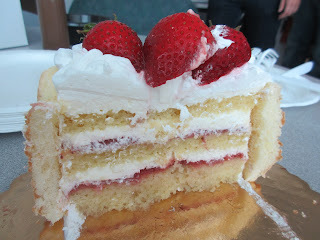 There were about three layers of cake with a whipped cream filling. There was some question as to whether this was real whipped cream or not but it wasn't the really bad ersatz cream so we do. Ruby red strawberries in a bed of whipped cream! 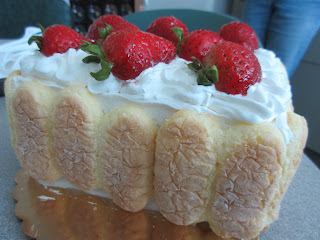 The lady fingers give it shape! 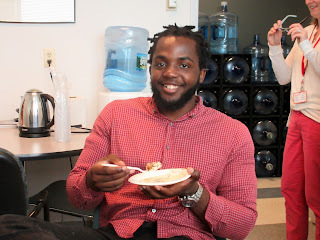 As the cake was freshly made it tasted good and was well received. Our crowd does tend to like things with fruit and whipped cream so it was a good choice if you want to ensure something woudl go over well. It was a big hit with one of our more recently arrived Japanese colleagues who took a picture so he could get it for his family. 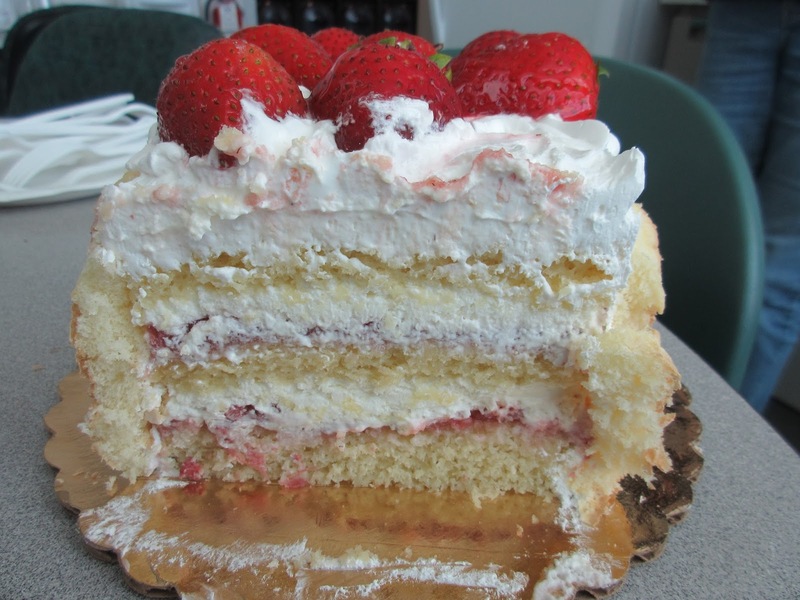 Thus does a simple little strawberry cake become a cross cultural treat! Lots of layers with lots of cream is a great combination! Wholesale warehouse stores along the lines of Costco and BJs can be a little intimidating because everything is huge. If you can buy in bulk and have the room to store it then these places can be useful. 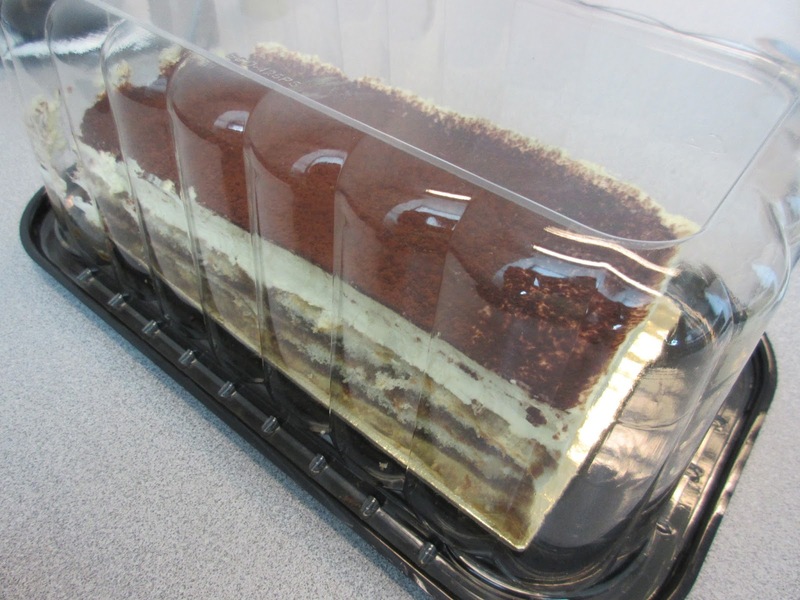 For normal amounts you are mostly wasting your time with a few exceptions such as the deli and the bakery. BJs has its own superior brand name that you have not heard of unless you have been to BJs. That name is Wellesley Farms. 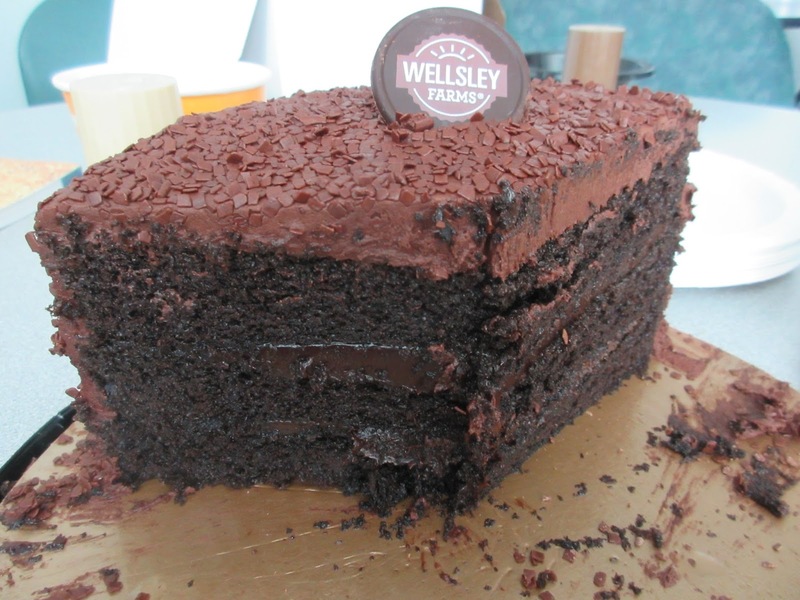 So if you see something from Wellesley farms you know where it came from. Simple but good looking chocolate cake! 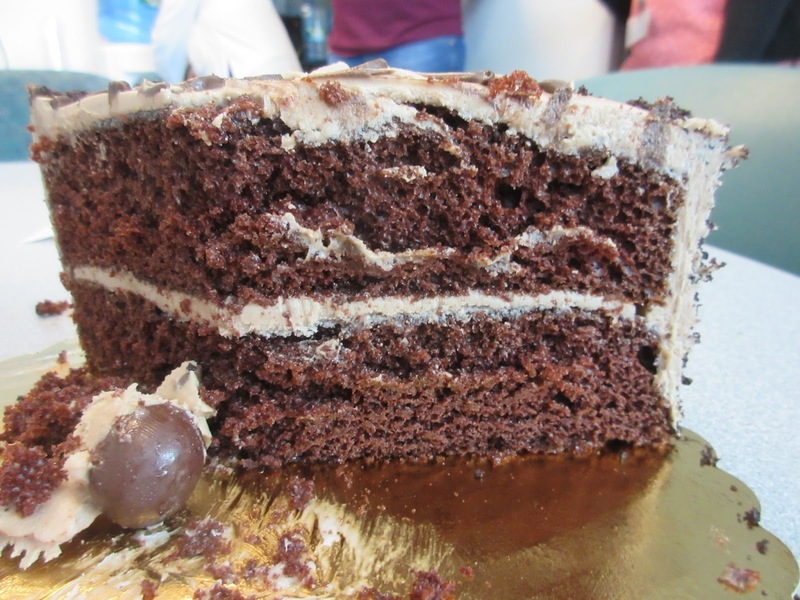 Smothered with those choco bits I would say. The clue that it came from BJs. 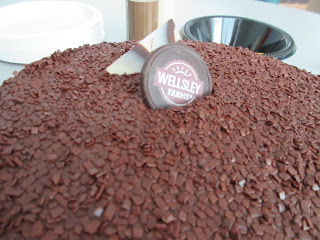 Today we had a sumptuous chocolate cake from Wellesley Farms. 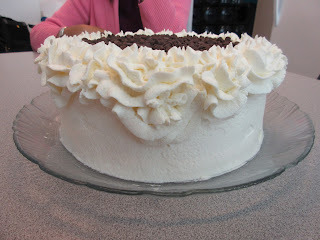 This was American style chocolate cake with butter cream or lard cream frosting, four layers with frosting in between. There was not much in the way of decoration but the whole cake was covered with what could best be described as chocolate confetti and I mean the whole thing - sides, top and maybe the bottom. 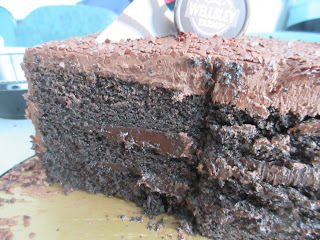 This was a very good chocolate cake and since we took it out early the frosting was nice and creamy as opposed to cold and congealed. This cake was moist and perhaps a little rich but nonetheless was enjoyable and as classic a cake as you can get. Ir would have been great with a glass of milk! Anyone got a glass of milk? One of our cake hour standard attendees is finally moving on from PVD. Having done his PhD and gotten his MD over the course of the last nine years, he is on to his internship at Mt. Sinai in New York City. It just so happens that his wife is quite an accomplished baker and had made many great delights over the years for cake hour. So they offered to bring in a farewell cake before the big move to PVD, at least for him. 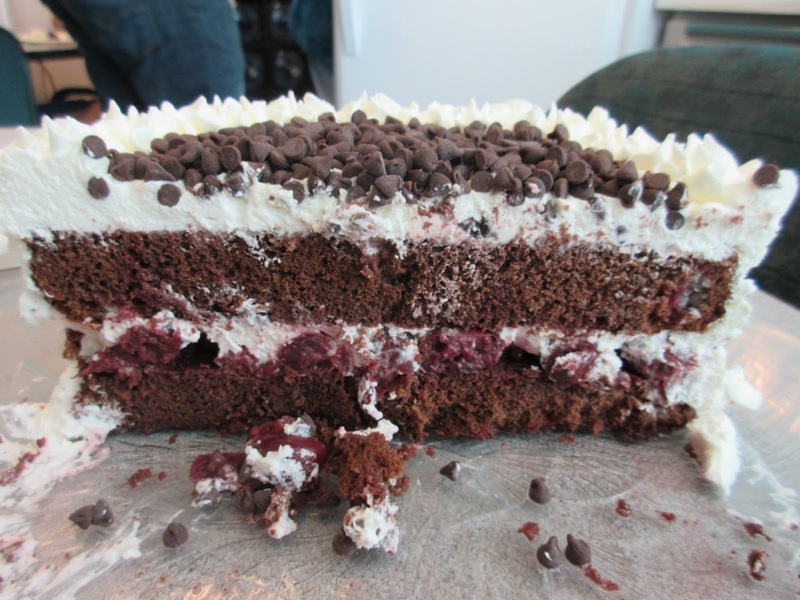 And what cake did they choose, the cake of all cakes a Black Forest cake. This is one of our favorites and arguably the world's best cake if it is made right which it was this time. It only took nine years but I'm heading out! Creative top for a Black Forest cake! 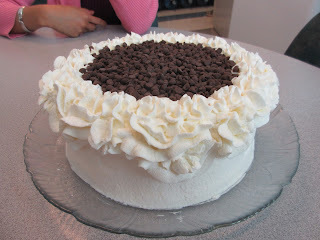 Great work with the whipped cream! Holding back the sea of chips! 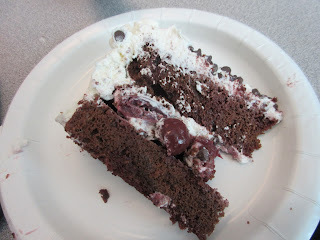 There are a number of posts about this but to reiterated the critical thing is that it not be too sweet, so the cherries in the cake are the dark sour kind, the cake itself is infused with Kirschwasser aka Cherry Brandy and the frosting HAS to be whipped cream. Happily today's baker knew all this and there was little doubt this would be well done. 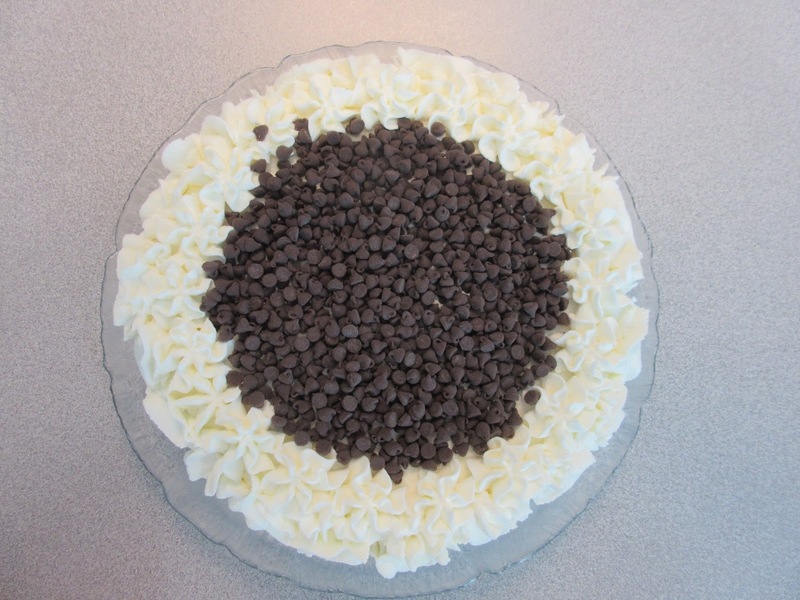 There was a little bit of a creative touch on the top in that instead of the shaved chocolate and cherry decorations, she opted for a field of small chocolate chips. 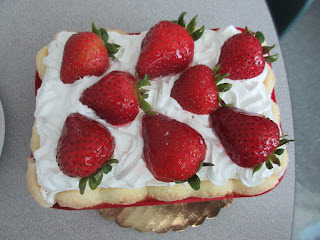 This was nice and the large whipped cream florets that were created to hold back the chips were great. The black forest cake was popular especially with those of our colleagues that are not into American overly sweetened pastries. It did not last long but we will look forward to a return visit sometime in the future from our cake hour pal. 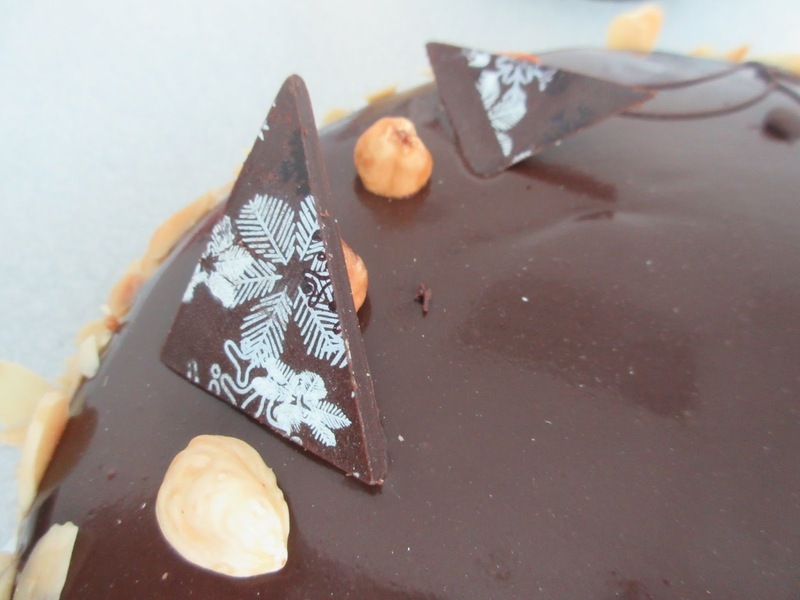 Cherries, chocolate, kirsch infused...all there! It didn't take long to get to the last piece! We learned today that working at the Research Center is for all practical purposes a vacation for some of our Japanese colleagues. Apparently in the Land of the Rising Sun long days are the norm and families may not get to see Dad until very later or the weekend. 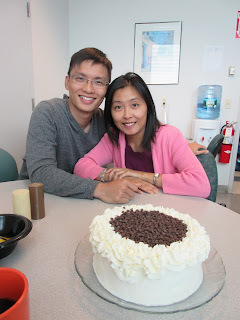 Here, during their research fellowship, they work pretty normal hours and get home in time for family dinner, This first well with the researcher and the spouse. It is a good gig for the researcher who develops prestige by doing this academic work abroad. It is a good gig for the spouse too because there is some help with the family. We wonder if this is the reason why, as we also learned today, that the wives really miss their American life once they get back. 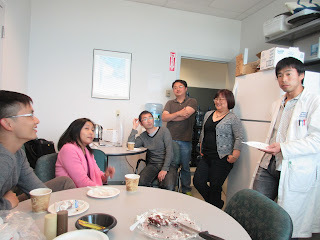 A little slice of heaven for our colleagues from Japan! 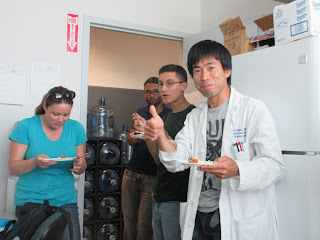 The summer research season is upon us! 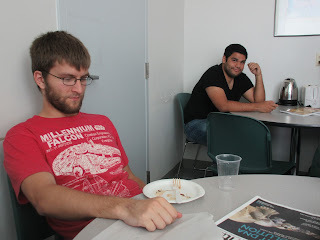 That means we will get a number of student interns from all over the planet from June through August. Cake hour has proven to be VERY popular with these interns over the years. Today was the first visit from a number of this year's crop including people from Brazil, New Hampshire and the Bronx. Yes, the last two locations are not that exciting but things are what they are. It's Tiramisu from Whole Foods! Their first treat was a classic and a favorite. The Tiramisu cake from Whole Foods is always a pleasure and we were happy to have it today. 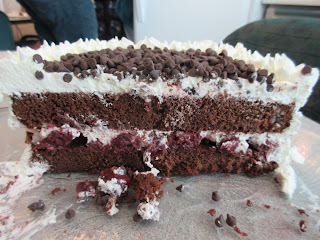 It was good and fresh with a nice balance of mascarpone to the other ingredients such as the soaked lady fingers and the cocoa powder. 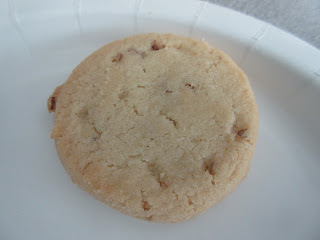 This one is never that sweet and light and easy to eat. Our new fans were happy to get off the ground with this. Cocoa powder aplenty on the top! 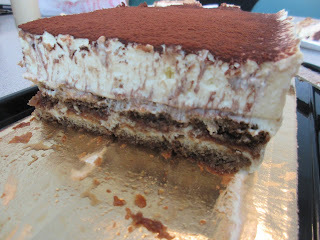 Nice balance of the mascarpone and the other stuff. One of them is a medical student. Weren't we surprised to hear that because the lectures are taped, people can and do skip classes and then review the Internet feed or videos in lieu of attending the course. Supposedly about 50% of the students learn this way. Just think, they are paying about $70,000 a year to look at a bunch of videos. That's a nice racket. We also wondered what would stop someone from downloading all the lectures and then start their own online medical school. You could charge a lot less and still make money!! Hopefully no one will give this a try. I wan't to be alone! I'm down on that online Med School idea!! I guess I can deal with a photo!